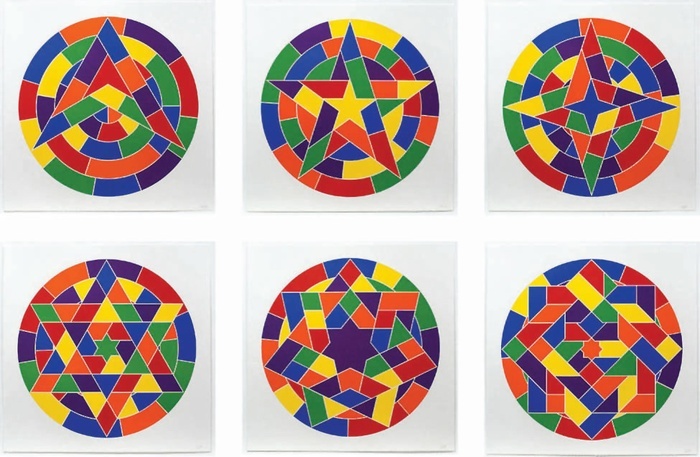 Sol LeWitt was an American artist most recognized for his contributions to conceptualism and minimalism. Born in Connecticut in 1928, LeWitt went on to study fine art at the University of Syracuse before serving in the Korean War. He moved to New York City in 1953, where he pursued his interest in design alongside his fine art studies at the School of Visual Arts. An entry-level job at MOMA exposed him to fellow artists Robert Ryman, Dan Flavin, Jasper Johns, Robert Rauschenberg and Frank Stella. LeWitt started to move away from the dominant abstract expressionist aesthetic of the 1950s, and became more concerned with conceptualism, making the idea his central focus. The open cube became a recurring form in his work, and developed into his three-dimensional structures, his cement cubes, and his infamous geometric wall paintings. LeWitt's work has been exhibited extensively and internationally, and he has had major retrospectives and museum shows at the Gemeentemuseum (The Hague), MOMA, the Kunsthalle Bern, the San Francisco Museum of Modern Art, the Museum of Contemporary Art, Chicago, and the Whitney Museum of American Art. His work can be found in important museum collections, including Tate Modern, London; the Centre Georges Pompidou, Paris; the Guggenheim Museum; the National Gallery of Art, Washington, DC; and the Stedelijk Museum, Amsterdam.